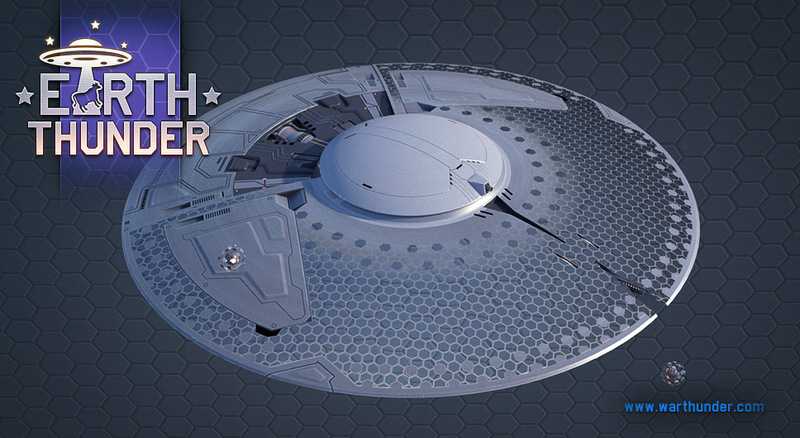 The alien combat vehicle is a radially symmetrical disc-shaped object with a rotating semi-spherical dome. This vehicle can move through areas of varying density with virtually no change to speed or manoeuvrability – it can fly through the air, hover near the surface of the earth, or move under water. The vehicle’s general construction, as well as the exact distribution of its modules, nodes and aggregates, remains unexplained, since no units have been captured for research purposes. As far as anyone can tell, the object’s propulsion system has several vectors, since it can manoeuvre at high speed across all surfaces. We know that the cockpit (occupied by an alien-controlled human pilot in this case) is located in a special combat capsule at the centre of the object, most likely directly underneath the rotating dome. In addition, witnesses have described a “force field” effect that activates when the vehicle flies or hovers near the surface of the earth, this is likely due to the redistribution of energy in the propulsion system. This force field makes the combat vehicle virtually indestructible to all types of weapons other than kinetic rounds. The principles by which the weapons system of the alien combat vehicle function have been described quite thoroughly. According to descriptions from first-contact survivors, the vehicle has three primary means of attack. The first weapon emits an energy beam of a thermal nature that, when focused on any part of an enemy target, destroys or melts it. This effect requires that the beam remains concentrated on the target for a specific length of time. The second is a kinetic weapon that fires hypersonic projectiles. Known as a “rail gun” in analytical materials, it has a low rate of fire and a high degree of striking effectiveness. For underwater engagements, the vehicle is equipped with special high-speed guided torpedoes that probably function according to the “fire-and-forget” principle of modern weaponry. A characteristic feature that has been remarked upon in the accounts of a number of first-contact survivors is the fact that these torpedoes can be destroyed with rail guns. However, rail gun projectiles are significantly less effective under water. This journalistic dossier will be updated with new information as the investigation into the Green Hills Incident continues. We will try to provide more up-to-date and relevant information about what is happening in the closed alien testing ground. The people have a right to know the truth. Honestly, out off all the games out there, Gaijin is putting up every year a masterpiece of an April-Fools event compared to others. Yes, it does get repetitive after some time, but that is to be expected, it is after all, 1 single new gamemode. brofessor, if you don't like it, you don't have to play it. Complaining about it just makes you a whiner. Wulf359, I AGREE WITH THE WULF. Pretty cool but I think more would play it if there were some kind of SL reward. I would def play this more if there was some type of XP/SL reward.. makes it more of a meaningful use of time. Krow777, I mean, it is a game. Don't always have to grind for a resource, can just enjoy it for what it is. Like a single-player game. Exactly. That's the only think I keep waiting for. Even though I should know better by now. It would take them probably a couple hours to plug in the new values. Instead they're gonna drag their feet on it as long as they possibly can. they really hyped this up too much. i was expecting something wayyy different and i'm really sad that they didn't give us something like mach 2 jets. still pretty cool ig. People tend to face disappointment when they assume too much. I don't feel sorry for anybody that aren't enjoying themselves on the basis that "this isn't what they wanted." I am currently pondering what kind of tech this could be previewing. I mean, given the last few years, it's obvious that it, again, might be a sorta tech-test, but for what? Harrier VTOL? German Tier V aircraft research tree additions. Thulle_, Hopefully that's not a Fools joke, since I take it seriously considering how reply involves no humor... so a new tech tree for aircrafts? that's kind of weird though, unless there are some problems with how current lineup goes that it requires an addition, or doesn't belong in the current tech trees as a followup vehicles. VTOL and Active Protection, at a guess. Object_770, Sounds about right, it's a great way to seriously test it while at the same time doing something fun. You know, having serious testing while not having serious gameplay. I like this, but it would be better if in such events you can earn something, at least silver lions would be the best thing, or some medal as the least thing, I mean, some achievement, or something at least, otherwise it's kind of a waste of time if not for fun...but fun can be short if it doesn't feel rewarding. You can win regular boxes with orders, backups, etc. like in regular battles (except SL). I just won 5 backups for various tanks. Tiger_x_Wood, what? how? I am not getting anything, 0 lions, no boxes, no nothing, just a regular gameplay without meaning. And I just started watching Project Blue Book. Coincidence!?!?! ?